Iwould like to leave a review for Miles AheadIf you have any feedback on how we can make our new website better please do contact us. We would like to hear from you. After 5 fails with another instructor and being let down 1 week before my next test!! I Found Miles Ahead on the Internet. Brian thankfully took me on even with such short notice. Unfortunately after only 2 hours of lessons and not being used to the car (changed from a petrol Focus to a diesel Fabia vRS) I failed only due to harsh braking. Being a older nervous driver Brian was able to give me back confidence i had lost after so many fails. He was never late and his technique for instructing is spot on. Correcting my weak points really helped and 1 month later i passed. Would recommend Miles Ahead to any new learners and both my children will be using them in the near future. Heather Schwarm. Aged 44 CASTLE VALE.... BIRMINGHAM.. Relax! It’s easier than you think! Understand this, Brian instructs you to his standard of driving which far surpasses that of the level required by the DSA. I passed my practical test first time thanks to the training I got from Brian. Brian would tell me that his mock tests were harsher than the actual D.S.A. test but still I was apprehensive about my practical test. At the end of my practical test I realised Brian was right, in fact the DSA test was easy in comparison to the standard of testing I was now used to with Brian. Brian was always on time and he was really flexible. Also it’s was not about “your time is up, out of the car” with Brian. If I didn’t understand something at the end of the lesson he would even go into his own time to explain it. 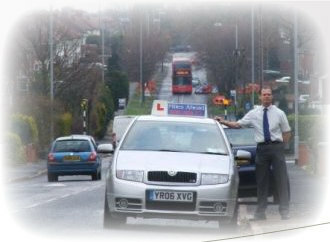 All I can say is this, some instructors are there to make a living, Brian is there to TEACH YOU HOW TO DRIVE PROPERLY!!! Hi, my name is Seng from Stechford. I am 19 years old and found Miles Ahead a really good investment. With college and work to juggle around with, it was very easy to squeeze in driving lessons as well. I used Miles Ahead for about 7 months and passed first time. the tuition that I received was from the highest standard as I was taught advanced maneuvers and how to handle situations that were outside the test but will definitely help in the long term. I would recommend this driving school if you want an instructor that will meet your required needs for tests and also something a little extra too. I had previously had 2 driving instructors before I met Brian, and had lost all my confidence in driving. Brian was always on time for my lessons, and was always willing to spend time explaining things before I tried them. He did not mind when I did not understand things, he used helpful analogies so I understood everything. Brian taught me a whole range of things and really rebuilt my confidence. He is very committed to his students and helped me to pass my theory and practical tests both first time. I could not recommend Brian and his driving school more highly. My name is Charlene, I am 29 years old and I live in Lozells Birmingham. I started taking lessons with Miles Ahead in August 2007. I was instructed well. I was advised to go ahead and take my theory test, I passed in December 2007. In my lessons I was taught practical instruction and my bad habits were picked up and rectified. For me it was convenient as Brian was flexible with appointment making and it suited me as I have children to work around. In regards to teaching methods I found Miles Ahead thorough and precise, Brian is very patient and calm in his ways. I am pleased with the results of my driving lessons, as I passed 1st time. With the help of Brian my confidence was at its peak and I understood the rules and regulations of the road. I have recommended Miles Ahead before and will continue to do so. The standard of teaching is flawless and worth every penny. I would just like to say a big "thank you" for all your helpful tuition that enabled me to pass my driving test, you were kind enough to rearrange lessons to fit me in at very short notice. Your lessons were conducted with patience and humour, which put me at ease and made the whole learning experience great, I will recommend your driving school to as many people as I can, all the best. Brian Saul is an excellent instructor, i found him to be very patient and encouraging, he consistently showed me where i was going wrong without me ever feeling criticised or down hearted. I was a very nervous pupil who first attempted to learn to drive 10 years ago. I hadn't got into a car for ten years and was very nervous. I passed my test within five months and would recommend Brian to any one who wants to drive. I am now doing the pass plus course with Brian and feel very confident driving. My name is Joe McSporran and I’m from Perry Barr, I’m 36 and work as an ICT Technician. After taking lessons and failing my Driving test (badly) at the age of 18, I decided that I should learn to drive again, aged 35. I had been in a small collision whist on a Driving lesson when I was 18 which left me extremely nervous about getting back behind the wheel. Brian took the time to put me at ease, never rushed me and showed imperturbable patience in which my confidence grew. During my driving lessons Brian was always helpful and full of great advice taking time to explain the reasons behind the questions, I passed first time. I went from a shaky, nervous driver to one that has confidence whilst on the road and I passed my practical Driving Test first time on 13th January 2009, a day I Never thought I’d see. I’ve been Driving a year now and each time I start the engine I remember the great bit advice Brian gave me “Always have respect in the way that you drive” I would recommend Brian he’s a great Driving instructor. "Having been adverse to learning to drive for some years now, I cannot praise Brian (and Miles Ahead) enough. With his help, I was able to pass both my driving theory and practical test first time! His friendly tuition is second to none (having tried to learn a few years before with another instructor - which did not go too well) and his willingness to fit his lessons to my demanding timetable and being prepared to start and end my lessons at numerous locations across Birmingham (due to the demands of my job) has been a real benefit to me! Brian (and Miles Ahead) - you are the best!!!" Having failed one test in wales and quickly taking another test in the Sutton area where i was unfamiliar and as a consequence, unfortunately failed a second time. Brian was not phased and persisted to give me constructive critique to bring me up to and well above the standard required. I also learnt far more about various types of driving besides the basics for passing the test. Brian is an excellent driving instructor! He helped me pass first time and was always very patient. Brian's explanations, instructions and techniques were clear and easy to understand and I soon became confident when driving with him. It wasn't all talk, as he used a range of different resources when explaining manoeuvres and driving codes, such as diagrams and models. Brian was always on time for lessons and I was able to fit lessons in around my busy schedule as he went above and beyond to be flexible and work around my other commitments. He also went into his own time on several occasions if I was struggling with something to make sure I understood it. I have learnt to drive safely and confidently, whilst having a bit of fun! Thank you so much Bri! After failing my test twice, mainly due to nerves, I was looking for a instructor who would restore some confidence in myself, and after reading the reviews about Miles Ahead I decided to give Brian a go, and how glad I did, Brian explained things in simple terms which really helped me, and after 5 lessons I passed my test. I have now recommended Brian to my partner and to anyone else who is wanting to learn to drive. Thanks Brian. Brian is a brilliant driving instructor who made me feel very comfortable with driving. His calm approach made me feel more comfortable in my ability to drive and he would take the time to go over things I felt needed work. He was exceptionally good at answering questions and I felt like his knowledge far surpassed the requirements. I was extremely happy with him as my driving instructor and was able to pass first time as a result of his tutelage. Beni Prince ....... SUTTON COLDFIELD... BIRMINGHAM..
To see a more reviews please tap on this link..
all verified by Free index.